Because these are so thin, they cook very quickly, and the chicken stays moist and juicy. Definitely use chicken thighs, not chicken breasts. The sauce is made with white wine, concentrated chicken stock, lemon juice, and parsley. It's meaty and lemony at the same time, and totally delicious. Be sure to make your own fresh breadcrumbs. It's really easy. Just grab a few slices of bread and give them a spin in a mini food processor. Don't bother cutting off the crusts. The fresh breadcrumbs really made a difference. 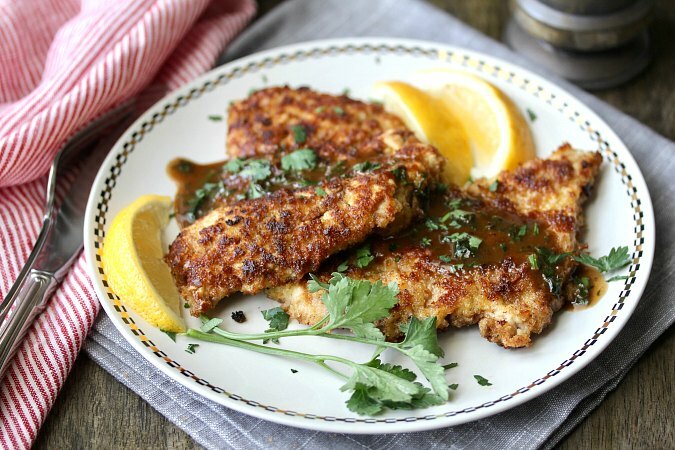 You can use a couple of large skillets to make the cooking go more quickly, or you can use just one pan, and stack the already fried cutlets on a baking sheet in a 200 degree F oven to keep them warm while finishing the cooking of the rest of the chicken. I used just one pan because I was trying these for the first time and wanted more "control." For the broth, I used a demi-glace because I love the concentrated flavor. You could also use a product such as Better Than Bouillon and reconstitute it with only half of the water, you will get a similar concentration of flavor. 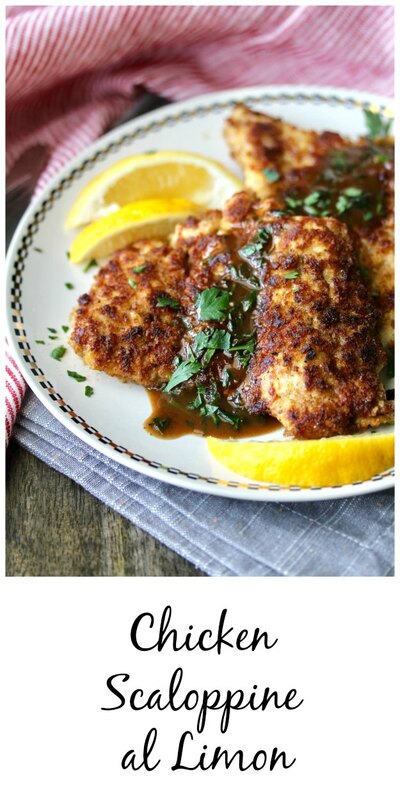 This recipe has been slightly adapted from the book Mark Bittman's Kitchen Matrix: More than 700 Simple Recipes and Techniques to Mix and Match for Endless Possibilities. Over 700 recipes in 300 pages! This recipe came from the section, Paillards, +10 ways, including beef, chicken, pork, and lamb. Wendy of A Day in the Life on The Farm chose this section for our weekly Kitchen Matrix meet-up, organized by Camilla of Culinary Adventures with Camilla. Paillards? This is a term I'd never heard until Wendy chose this chapter. To me, they are cutlets. A quick trip down the Google rabbit hole, and next thing you know I'm reading about the etymology of the word, but I still couldn't find out why where I live the word is "cutlet," and elsewhere it's "paillard." If you have any knowledge (or even a theory), I'd love to hear about it! After the recipe, be sure to check out Camilla's and Wendy's paillards! And go ahead, grab a mallet and pound away. Heat the oven to 200 degrees F with a quarter or half sheet pan on the middle rack. Spread out each piece of chicken thigh open like a book (butterfly if necessary), and place them between two pieces of plastic wrap. Using a mallet or a heavy skillet, pound the chicken until it is 1/4 inch thick. Sprinkle each with salt and pepper on both sides. Set out three shallow dishes, one with flour, one with bread crumbs, and one with the eggs. Heat a large skillet over medium heat and add the oil and butter. Dip a piece of chicken in the flour, then the egg, and then the bread crumbs. Add the chicken to the skillet and cook about two minutes a side, until golden brown. The chicken should be firm to the touch. You can check for doneness with a thin knife. Transfer to the pan in the oven and continue cooking the cutlets, adding more olive oil and butter as needed. 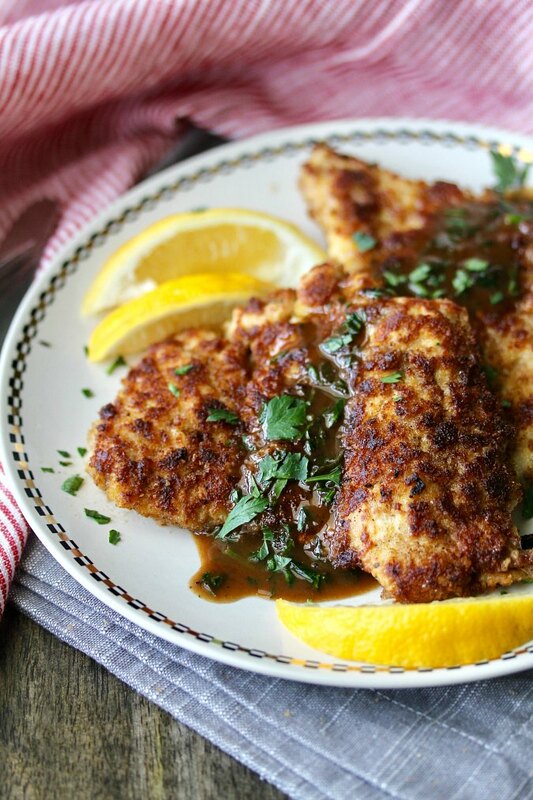 Once you've cooked the cutlets, add a tablespoon of olive oil and a tablespoon of butter to the skillet and sprinkle with 2 tablespoons of flour. Cook over medium high heat, stirring constantly, for 3 to 4 minutes. Add the white wine and stir, scraping up any bits from the bottom of the pan. Cook until the wine has reduced, about two minutes. Add the stock/demi-glace and lemon juice. Cook, stirring constantly, until the sauce has slightly thickened, about 3 to 4 minutes. Remove the pan from the heat and add another tablespoon of butter to the sauce and stir until the butter has melted. Stir in the 1/4 cup of parsley. Season the sauce to taste and spoon it over the cutlets. I will try this one, but.... will use boneless chicken breasts instead. Let me know how it goes. They are usually too dry for me, but maybe the pounding will tenderize them! Glad you had fun with this one Karen. This was the other one I wanted to try. I loved learning a new word, too. Paillard! So fun. I especially loved pounding that chicken with my rolling pin. Chicken thighs are definitely tastier then breasts. 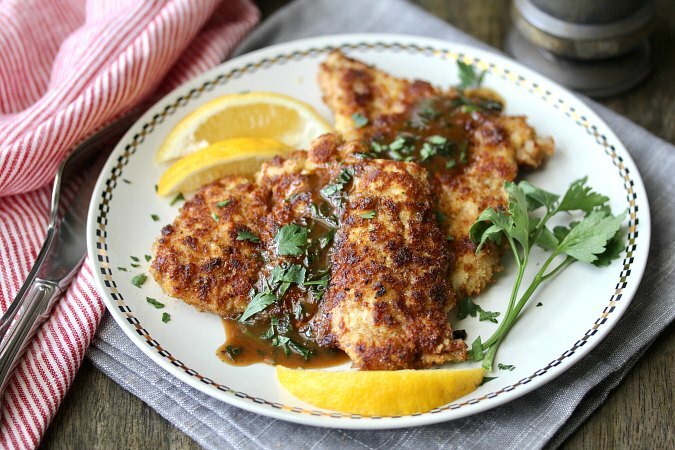 You're right calling these Chicken scaloppine, as they are indeed a chicken version of the classic dish. We call this type of chicken "chicken schnitzel" mostly, in our country. Fresh breadcrumbs make indeed A LOT of difference, excellent tip! Off we go to read your beautiful Ecuadorian rolls! I'm so glad you're back! Schnitzel is another word for these that I found on the internet! How cool is this! we both have chicken cutlets on our front pages!!!!! Now I regret I did not write "pound the heck out of them" - I like precise instructions, and you did it! I'm a fan of chicken thighs too. Lemony ones sound so good. Now, this is some dreamy chicken! Nothing dull or bland about it and I totally want to see it on my dinner plate!!! This looks absolutely amazing! I'm going to try this out once the weather cools down! Definitely prefer chicken thighs over chicken breasts. These ones look absolutely divine!